. 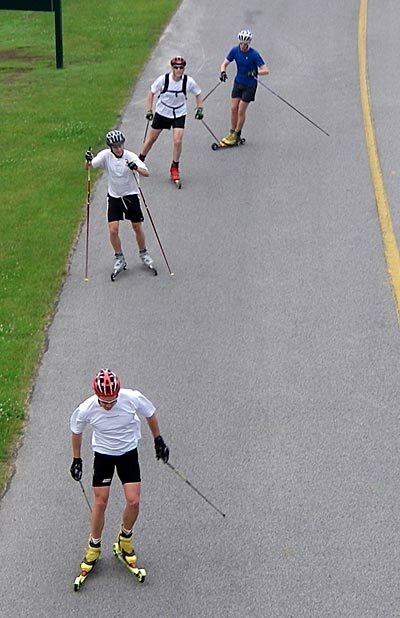 : Safe Rollerskiing: Best Practices for Athletes and Coaches :: Ski XCOttawa.ca :: Skiing in Ottawa and Gatineau Park :. 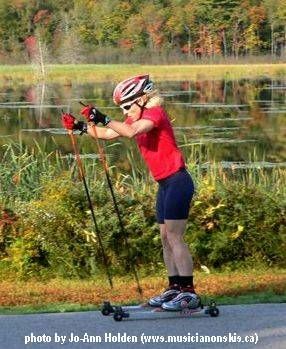 The use of the Gatineau Park for rollerskiing is a privilege that has been negotiated with NCC on your behalf by the National Capital District of Cross Country Ontario. This Agreement allows for the responsible use and management of closings by the local sport community. The NCC charges an annual fee which is paid by the National Capital District. Although the Parkways are closed to cars, it's important to remember that rollerskiers share the Parkways with other users: cyclists, in-line skaters, pedestrians, and other rollerskiers following a variety of programs. Keeping recreational Parkway use without incident, safe, and enjoyable for all users is critically important to its continued use by skiers for dryland training. The Parkway road system is bi-directional: when you are moving on the Parkway, always stay to the right and on your side of the yellow line. There should always be room between you and the yellow line for an overtaking cyclist or roller skier; the overtaking traffic should not have to veer into the oncoming lane to get by. Always be aware of other traffic around you and check both ways before making sudden changes in direction. Under no circumstances should you roller ski more than two abreast. Rollerskiing in single file if preferable while skate skiing uphill, if you need to ski double, be aware of others on parkway and move over if they need to overtake you. Exercise caution on downhills: ski a safe distance apart while descending and no more than two abreast at any time. If and when you stop moving, step off the Parkway onto the shoulder. Ensure you are off the road at the appropriate times; 10:00 on most weekends, 9:30 during peak colours (refer to fall calendar on the NCD website for exact closing times). Be courteous to your fellow Parkway users, even if they do not reciprocate in kind: any complaints of bad behaviour to the NCC will jeopardize the Agreement for all of us. Some Guidelines for Coaches . . . When instructing groups of athletes who may be stationary, have them step off the pavement onto the shoulder until you are ready to resume skiing. If a hill is being used for an activity where people may stop and start, this should be done near the top of the hill, or far enough down the run out of the hill where other users' speed is low. Be particularly careful of other roller skiers who may be moving at speed on downhills when conducting a training session. Under no circumstances should an entire lane be blocked by an activity. This is particularly critical on a hill. Use judgement in taking inexperienced skiers on the P8 to Mica stretch of the road. Inexperienced skiers should stay on the P8 to P9 loop. Have a safe and productive training season! This article was originally published on www.xcottawa.ca on September 21, 2007. Gatineau Loppet: Keski Report #12 - Dealing with Illness. Training Log: Getting Back in the Swing of things in Ottawa - A look into a skiers early fall training.